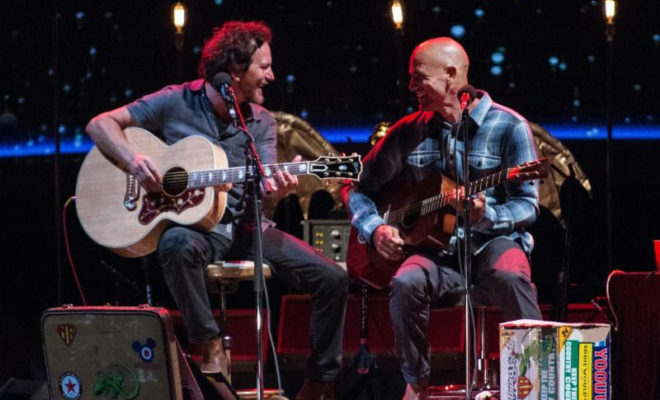 EDDIE VEDDER (EV): I believe the idea was simply this–where can we set up a stage or two as close to the beach as possible! After months of research, the answer came back, Doheny. This was stunning news to me as Doheny was the spot where I caught my first waves as a kid. I had carried so many indelible memories of being nine and ten years old out there. Buying eight feet of bungee cord from Jack’s Surf Shop to fashion a leash (or leg rope), was so dangerous…those cords came whipping back. It really came flooding back to me the day before the first show. My first time back since all those years ago. Looked just the same. Except we had some bleachers set up on the sand and a great sound system that you could hear while paddling in the line up. It would be really great to play every spot mentioned in the song “Surfin’ USA.” So far we got Doheny and Waimea Bay. I gotta get on that. EV: I guess what I have to say is that it’s been a true honor to work with the community and organizers to create a stimulating vibe and uplifting atmosphere for the great crowds and incredible musicians who come out to play in the park. To have the Pixies, X, Mudhoney, Jack Johnson, etc., etc, etc. play your festival has been so satisfying. Far beyond our initial vision for it all. Seeing Fiona Apple play a truly joyful set in the sun, I know I’ll never forget that. Being there while Lana Del Rey and Chan Marshall (Cat Power), hung out for the first time. (Lana, who is singing on Cat Power’s new single. When you get to witness that and know you’ve had a small part in that, there’s definitely a healthy sense of pride you can glean from that. Practicing a song backstage with Elvis Costello. Another highlight. When he starts singing from the chair across from you, you’re hit with the realization that he is equipped with his own personal P.A. system in his throat. Perfectly tuned and a voice that’s like no other. It’s Elvis! EV: I’m building up my stamina now ’cause I don’t wanna miss a thing. Johnny Marr and I worked together with Neil Finn, so I’m excited to see him again. Beck, Legend. John Doe, Legendary Legend. The Yeah, Yeah, Yeahs…truly amazing live. Pow Pow Family Band made a super exciting first record, can’t wait to see them live. A young surfer named Jonny Roundhouse writes songs about surf and is so perfect for the bill. Liz Phair, Mumford and Sons, Norah Jones, Amos Lee, Eric Church…it just keeps going. I’d really like to hear at least one band a day from in the waves. Music and surf, the ultimate combination. And I hear there’s a swell coming in just for the occasion. Nature Approves. Surf’s Up Ohana! ● Who in the future? EV: Not everyone knows that Springsteen was a full-on surfer back in Jersey. His first bands used to practice in the warehouse of “Challenger Surfboards” back in the day. All their gear was covered in the dust and resin emanating from the shaping room. It sure would be something to hear his live vocals pushing out over the waves. But man, he’s been working hard on Broadway. By year’s end he would have played 250 shows…so I’m not gonna be asking him anytime soon…the Boss needs a break! Pearl Jam would be another good one. If I only had an in. Megan & Liz Interview 3! Crown The Empire Announce Headlining Tour!